Take time to breathe. Take time to create. Take time to reflect, take time to let go. 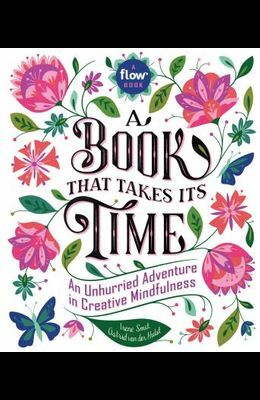 A book that's unique in the way it mixes reading and doing, A Book That Takes Its Time is like a mindfulness retreat between two covers. Created in partnership with Flow , the groundbreaking international magazine that celebrates creativity, beautiful illustration, a love of paper, and life's little pleasures, A Book That Takes Its Time mixes articles, inspiring quotes, and what the editors call goodies--bound-in cards, mini-journals, stickers, posters, blank papers for collaging, and more--giving it a distinctly handcrafted, collectible feeling. Read about the benefits of not multitasking, then turn to The Joy of One Thing at a Time Notebook tucked into the pages. After a short piece on the power of slowing down, fill in the designed notecards for a Beautiful Moments jar. Make a personal timeline. Learn the art of hand-lettering. Dig into your Beginner's Mind. Embrace the art of quitting. Take the writing cure. And always smile. Move slowly and with intention through A Book That Takes Its Time, and discover that sweet place where life can be both thoughtful and playful.